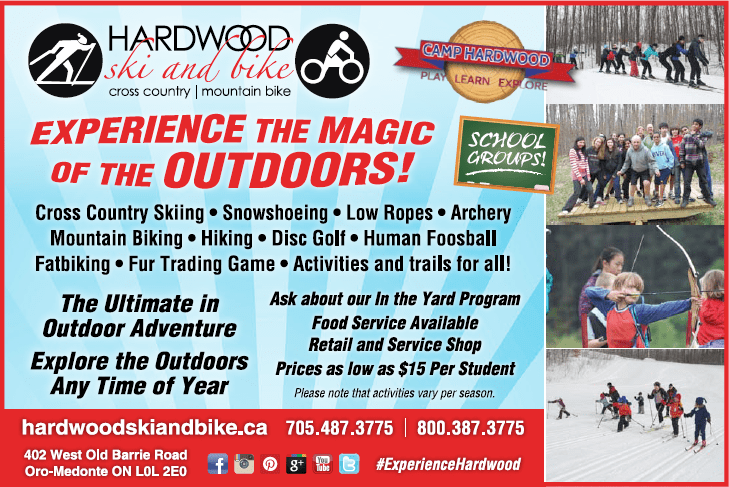 Hardwood is located in the heart of Oro-Medonte offering over 80kms of Mountin Bike Trails, 40kms of Cross Country Ski Trails and 11kms of Snowshoe Trails. School groups are welcomed in our West Wing where they can store their bags and food service is available. At Hardwood Ski and Bike we value the benefits of a healthy lifestyle. Introducing outdoor recreation to students at a young age will reap long term benefits. Safety is our top priority. Our management personnel are all trained first responders, our instructors are NCCP, CANSI or PMBI trained. Students and teachers are given clear direction and taught trail etiquette to maximize safety. Helmets are included and mandatory for all biking activities, offering your school a safe and fun way to enjoy the outdoors.